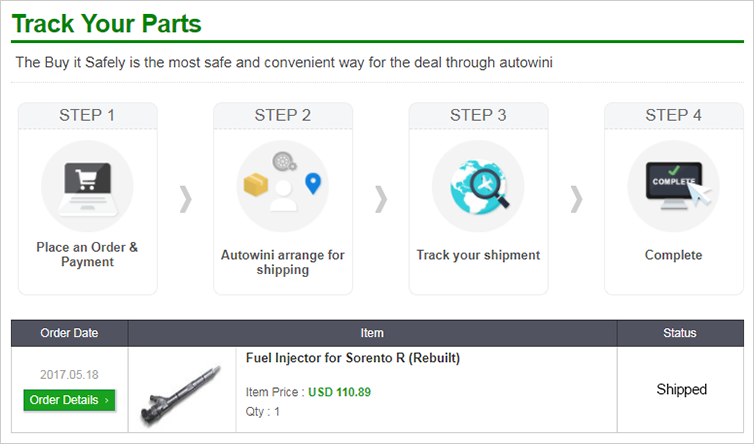 What is "Autowini Parts Shop"? "Autowini Parts Shop" is Autowini`s Automotive parts & accessories Express service. Autowini Parts Shop offers the quality vehicle parts at competitive market price from reliable manufactures in S.Korea. Before purchasing, please check the exact parts numbers for your vehicles. If you do not know the exact parts numbers for your vehicles, please send us a message with your vehicle's VIN Number / Model Year / Model Name / Engine Type. We will check the exact parts number for your vehicles what you need. All items will be arranged shipping within about 2 – 4 business days upon payment cleared. Delivery usually takes 3 – 5 business days to your door via FedEx, DHL or EMS. After shipment, we will inform you of the tracking number. You can track your item deliveries. Benefits of using "Buy it Now"! The quality parts of Hyundai and Kia from reliable manufactures in S.Korea. Small quantity order? No Worries! We do deliver even one piece! Far faraway? No Worries! We do deliver to every corner of the world! Q Does the total price include customs tax? No. Custom duties or import taxes are not included in the item price and shipping charge. You will pay customs duty and tax in your country. Q How is the shipping charge calculated? We use volumetric weight when determining the weight of the shipments. Volumetric weight is calculated by multiplying the length x height x width of a package. Therefore, even if the weght of the item is light, a shipping charge will be calculated according to the volume of the item. Q I want to purchase more than 10 units. The maximum quantity of purchases through ‘Buy it Now!’ is 10 units. If you want to purchase more than 10 units, please us a message with the item name and your vehicle's information in detail. We will send you the invoice. Q What if I receive the wrong item? If the item delivered is different from that which was ordered, please email to us. After confirm, we will send you the correct parts again. If you have any further questions about Autowini Parts Shop, contact us at any time! We are here to support you.